Russia 2018 World Cup has experienced some dimensions of wonder so far, in the first six (6) days of the first round in the finals, giants have fallen; Morocco lost to Iran 0-1, Germany 0-1 Mexico, while some giants were unexpectedly held to a draw; Portugal 3-3 Spain and Argentina 1-1 Iceland. On the last day in the first round of the group stage (Tuesday 19th June), another wonder experienced as Japan defeated 10 men Columbia 1-2; becoming the first Asian country to defeat a South American team in the history of World Cup. One of the fastest Red Cards was even awarded 3 minutes into the game. As if that was going to be all in the first round of matches since most African teams have refused to pull their weights, apart from Tunisia who managed to score a goal against the young and talented England in a hard fought match. Meanwhile, a list of the expectations or wonders in the tournament might not have included an African team defeating a European team but such became the last wonder experienced in the first round of the group stage in The Russia 2018 World Cup as Senegal defeated Poland on a 1-2 score line. Obviously, the height of wonder is not seen yet, as the tournament looks characterized with dramas seen and many yet to be unfolded. Nigeria’s Super Eagles arrive Volgograd, ready for Friday match. Morocco hopes for a better day as Portugal seek first win. Ahmed Musa fires to revive Nigeria, Argentina hope. Ronaldo hat-trick against spain fires Portugal to a dream start. At Sunday’s final between France and Croatia, Croatian president Kolinda Grabar-Kitarović was a literal bright spot in the crowd. You couldn’t miss her. A combination of brains, beauty and power. Could it get any more potent than that? Dressed in a red-and-white team jersey, Grabar-Kitarović spent most of the game on her feet, cheering in support of a squad that ultimately lost the 4-2 final. Before being invited into the VIP box as a guest of Russian President Vladimir Putin, Grabar-Kitarović watched every single one of her team’s appearances from the stands with fellow Croatia fans. Being a visible booster for a winning team is one of the fun parts of being a leader. Croatia has never advanced to a world cup final before and the team, led by captain (and former refugee) Luka Modric, were national heroes. But when it was over and Croatia was left to reckon with the deeply disappointing defeat, Grabar-Kitarović was as present and supportive as she’d been during their ascent. She embraced a shattered Modric after he was presented with the Golden Ball, the tournament’s most valuable player award. A hard rain started to fall during the final award ceremony. As handlers rushed to put umbrellas up over the heads of Putin and other dignitaries, Grabar-Kitarović stood in the rain to shake the hand of every player on both teams. A former Fulbright scholar, ambassador to the US, and assistant secretary to NATO, Grabar-Kitarović is leading an emerging eastern European economy at a tremendously precarious time for the postwar global order, and only a few decades removed from the region’s bloody civil war. Standing by the team during its moment of public disappointment is as powerful a statement as celebrating in the good times. The value of leadership above partisanship in fact written it into Croatia’s constitution. Prior to her election in 2015, Grabar-Kitarovićwas a member of the center-right Croatian Democratic Union, but resigned immediately from the group upon election. Presidents in Croatia can’t hold any party affiliations in office. As leaders they must represent an entire nation, and there can’t be any question of whose team they are on. At the 2018 FIFA World Cup in Russia, innovative technology is being put to work in ways the sport of soccer has never seen before. Thanks to the use of replay tech called Video Assistant Referee (otherwise known as VAR), penalties, offsides, and other infractions are subject to review whenever the on-field referee deems it necessary. Seen by many as a sort of 12th man, VAR tech figures to have a significant impact on the outcome of almost every World Cup match. For several years, major sports have turned to instant replays to help on-field officials make the correct call. The NFL makes use of a replay system to review every scoring play or turnover, without a coach having to use one of the team’s two allotted challenges. Replay is also used in the NBA to determine which team should be awarded a side out on close plays inside the last two minutes of each half. Soccer refused to participate in this trend — until now. VAR use is fairly straightforward, according to FIFA: When an incident occurs on field, the referee informs the VAR (or sometimes the other way around, should the virtual ref spy something the non-field ref missed). 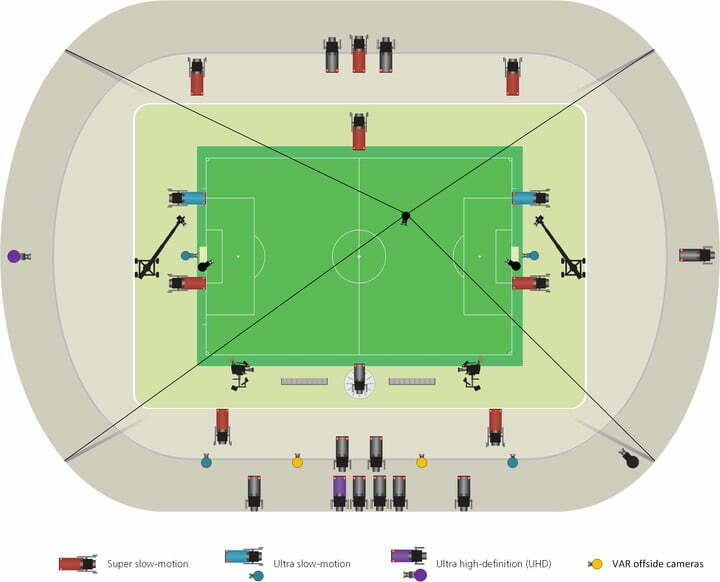 The VAR reviews footage from the numerous cameras stationed around the field; according to FIFA, the video assistant referee team has access to 33 broadcast cameras, eight of which are super slow-motion and four of which are ultra slow-motion cameras. There are ultra high-definition (UHD) cameras as well. After the VAR reviews the video footage, he relays his advice to the on-field referee, who then makes a judgement based on that information. As it makes its official debut in Russia, its influence on World Cup matches is changing the trajectory of the tournament. To help keep track of VAR’s usage, we’ve compiled the following list of every World Cup match in which replay was used — and seemingly altered the outcome. It seemed Portugal was headed to a thrilling 1-0 victory before the use of VAR confirmed a Portugal handball in their own box in the 93rd minute. Iran’s Karim Ansarifard converted from the spot to draw Portugal, yet it wasn’t enough as Iran was still eliminated from contention. In a match capable of deciding if Spain or Portugal would top Group B, Morocco held on to a 2-1 lead with mere minutes remaining. In the 91st minute, Spain’s Iago Aspas netted the equalizing goal that required a several minute VAR review to confirm. The draw put Spain on top of the group and officially eliminated Morocco from the World Cup. Down 2-0 with roughly 10 minutes to go in the match, Iceland was awarded a penalty kick after VAR concluded Nigeria committed a foul in the penalty box. Unfortunately, Iceland wasn’t able to convert the PK and the scored stayed 2-0 until the final whistle. In the second half, Brazil superstar Neymar appeared to be tugged to the ground by Costa Rican defender Giancarlo Gonzalez. After initially awarding Brazil a penalty kick, the referee leaned on VAR to show Neymar did, in fact, flop in the box. Brazil ended up winning 2-0 after slotting home two second-half, extra-time goals via Philippe Coutinho and Neymar. Denmark had the lead during the first half, scoring a goal at the seven-minute mark from the foot of Christian Eriksen. However, seven minutes later, the VAR confirmed a penalty in favor of Australia, giving the Socceroos a penalty kick that equalized the score at 1-1. That score held true through the final whistle. A hard-fought match between Iran and Spain culminated in 1-0 victory for the Spaniards. Yet Iran saw two of its potential goals called back due to offsides calls. The first was clear, while the second required the use of the VAR to determine. Sadly, players celebrated the goal only to be disappointed moments later. Portugal’s opening match versus Spain was more than just a match between European powerhouses: It marked VAR’s official coming out party on the World Cup stage. With Portugal up 1-0, Spanish striker Diego Costa equalized in the 24th minute and the referee made use of VAR to ensure there were no f0uls prior to Costa’s strike. A thrilling match, the final score was a 3-3 draw. During the match, the referee leaned on VAR replay to determine whether to award a penalty that was being asked for by the Peruvian team. Despite the ref ultimately calling a penalty in Peru’s favor, Christian Cueva missed the shot and Denmark prevailed in the game thanks to a goal from Yussuf Yurary Poulsen in the second half. After a foul inside the penalty area, VAR was used to verify a penalty in favor of Egypt. From the spot, Mohamed Salah executed an excellent strike to score his first goal for his country in a World Cup. During the first half of Sweden’s match versus South Korea, the referee did not mark a clear foul — and thanks to VAR, Sweden was awarded a penalty. The reversed foul resulted in a PK that was executed successfully by Sweden, marking the only goal of a game Sweden would go on to win. After France forward Antoine Griezmann was fouled inside the penalty area, VAR confirmed the penalty and awarded France a penalty kick. The play took place roughly 11 minutes into the second half as Greizemann was shot down by Joshua Risdon. At first, the foul was not charged but the ref quickly turned to replay help. The game ended with a final score of 2-1 in favor of the French.